Dual polarity ±15Vdc, 500 milliamp stabilised power supply module complete with a 230Vac mains chassis transformer. 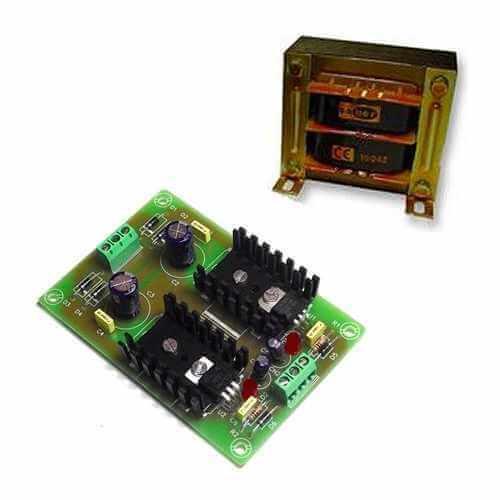 It provides one 15V+ positive rail and one 15V- negative rail output. The module provides a stabilised output with short circuit protection, LED indicators and screw terminal blocks for connections. The module is supplied fully assembled. All you need to do is house it in a suitable enclosure with the supplied chassis transformer, add the wiring, a suitable fuse and on/off switch. Ideal for powering many projects. Continuous output current 500 mA max. Peak Output current 700 mA max. Ripple (with load) 10 mV max.